And the big man, is that Mr. Winston Churcill ?? Great angle of a familiar spot. Good shot - sure looks like Winnie! Mo, I just love this shot. Your interpretation of the theme is fabulous but regardless it's such an arresting photograph. Just incredible. Did you do something clever and add the man afterwards or what? Or simply (!) 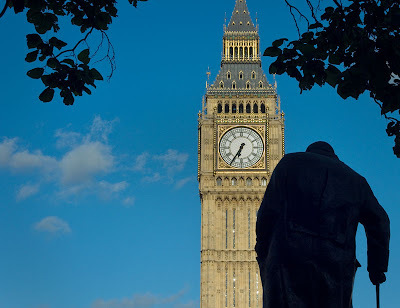 like not simple, bend down and get the silhouette of the man with Big Ben in focus. Super stuff. I do love your photo, thinking about Churchill, is'nt it ? It has the theme in its name even! Beautiful composition. Brilliant photo, I love it! Thanks for answering the question, Mo. Well I'm even more impressed now. Beautifully framed shot. Well done. Ben has never looked as good. Usually, he is surrounded in gray. Your choice is absolutely perfect. Love the image and the title, perfect choice for the Theme Day. Ben 'n' Winnie eh! Terrific shot. All ways round excellent, idea and exceution of the image. Has to be my favourite big. Sometmies you see an image and you just think, damn I wish I'd taken that. That is a truly brilliant picture. Could be a marketing poster for London! This is such a wonderful and moving image. Love seeing your images. I agree with B. Excellent choice. I'll big-up your very British post! excellent interpretation and we all can relate to Big Ben! it is so regal in appearance. Great shot perfect for Theme Day. Wonderful shot. Love the contrast in the very blue background and the silhouettes of the tree and man. It's a great balance with the glowing gold of Big Ben. Fabulous shot. I love how blue the sky is and how Big Ben seems to gleam. Can I take it to be my postcard? A great shot Mo, excellent composition.....a prize winner. Very good. Little fluffy clouds as well, challenging our perception of your eternally lousy weather. Can't be that bad, can it? Big Ben, the great Bell! yep those are definitely big! I agree with everybody. Fantastic shot. Ciao. A.
Neat photo. Perfect for today's theme. You captured 'Big' and 'Huge'. This is an amazing shot! What a great perspective. Love the turquoise sky and the way Big Ben looks against it. Sorry I've been MIA for so long - still trying to catch up on my blog surfing!